DIE Jovis, videlicet, 7 die Julii. Justice Reeves Leave to be absent. Lord Mayor to call a Common Council, for disposing of the Arms from Hull. with Information of a Conspiracy against Tristram Whitcombe. and with an Order to pay 100 l. to Facie, for the Education of Two Sons of the late Lord Cawfield. and with an Order for Sir William Fenton, to be a Reformado Captain of House in Munster. Message from the H. C. with the Treaty for 10,000 Scots for Ulster. Message sent to the H. C. with the Order for Lords Lieutenants and Deputy Lieutenants to assist one another. The Order for 1000 l. for Landguard Fort. Earl of Peterborough Leave to go in the Country. The Order for Lords Lieutenants and Deputy Lieutenants to assist one another. Captain Pointz took the Bishop of St. David's in Disguise. Bishop of St. David's sent for, and the Captain to be rewarded. Sir J. Mennes attends, and has submitted to the E. of Warwick as Admiral. Declaration concerning the Earl of Stamford. Answer from the H. C. about Sir John Mennes. Message from the H. C. to empower the Committee of Safety to take Arms, &c. from The Tower or elsewhere. Arms, &c. to be taken out The Tower, &c. by Order of both Houses. Sir Jo. Mennes discharged out of Custody. Mr. Maccarta to have 30 l.
The Lord Mandevile was appointed Speaker this Day. Ordered, That Mr. Justice Reeve hath Leave to go to his own House after the Circuit, and to stay there until he be sent for. Ordered, That the Lord Mayor do give an Account to this House, why he hath not called a Common Council, according to a former Order of Parliament, concerning the storing and disposing of the Arms that came from Hull; and that he shall speedily call a Common Council. "1. Ordered, That the Lords be moved, to join with this House, in an Order to the Lord Mayor, to require him to call a Common Council, to meet To-morrow, at Two of the Clock in the Afternoon." "That all Ships that are in the Service of the State, and abroad, shall now obey the Earl of Warwicke, in such Manner as formerly they did the Earl of Northumberland; and that a Copy of this Order be particularly sent to every particular Ship; and that the Committee for the Defence of the Kingdom do take Order, that this Order be sent down accordingly. "3. The Lords and Commons in Parliament affembled, having received Information, that some ill-affected Persons, in the City of Corke, in the Realm of Ireland, have conspired to indict one Tristram Whitcombe, Esquire, Sovereign of Kinsale, of Treason, upon Pretence of some Information (fn. 1) "
"4. It is this Day Ordered, by the Lords and Commons assembled in Parliament, That the Treasurers for the Loan and Contribution-money at London shall pay unto Richd. Facie, Schoolmaster, of Henly upon Thames, One Hundred Pounds, out of the Monies that are now come in upon that Act, to be employed for the Relief and Succour of Wm. Caufeild and George Cawfeild, Sons of the late Wm. Lord Cawfeild, deceased, and Brethren to Tobie Lord Cawfeild, who, since the Rebellion in Ireland, was cruelly murthered by some Forces of Sir Phelym O'Neile; and their Mother, with her small Children, are still detained in Prison, and utterly ruined in her Fortune, and dispoiled of her Estate; the said Wm. and George Cawfeild being at this Time, and having been for a long Time, placed with the said Mr. Facie, for the learning the Greek and Latin Tongues, and other fitting Qualities." Ordered, That (fn. 2) this House agrees with the House of Commons in this Order. 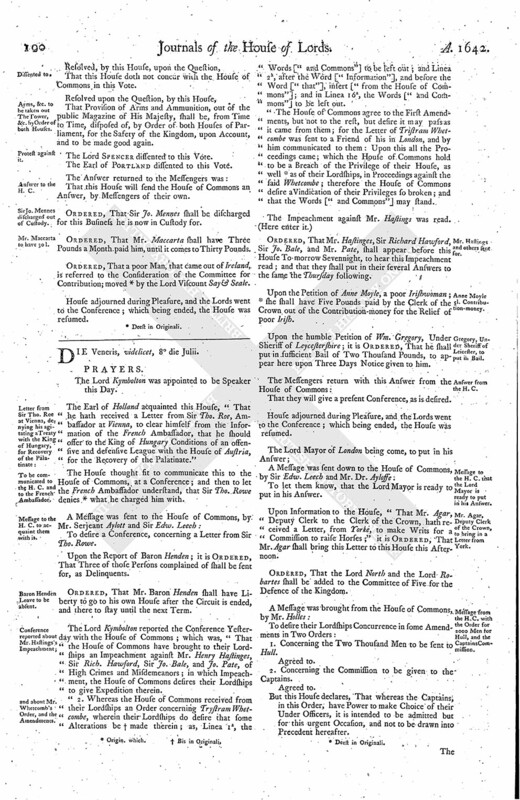 That this House agrees with the House of Commons in the Order concerning the Common Council; the Masters and Mariners to obey the Earl of Warwick at Sea; and concerning the Lord Cawfeild's Sons: But concerning the Order touching Mr. Whitcombe, this House will send an Answer, by Messengers of their own. 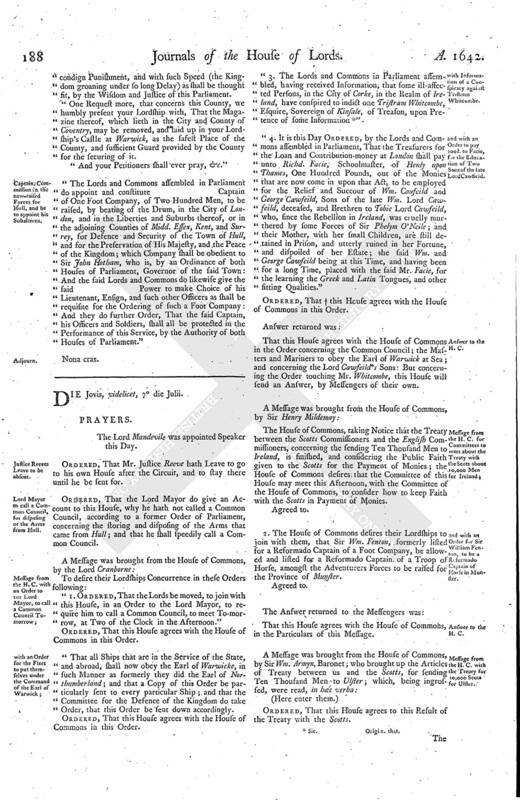 The House of Commons, taking Notice that the Treaty between the Scotts Commissioners and the English Commissioners, concerning the sending Ten Thousand Men to Ireland, is finished, and considering the Public Faith given to the Scotts for the Payment of Monies; the House of Commons desires that the Committee of this House may meet this Afternoon, with the Committee of the House of Commons, to consider how to keep Faith with the Scotts in Payment of Monies. 2. The House of Commons desires their Lordships to join with them, that Sir Wm. Fenton, formerly listed for a Reformado Captain of a Foot Company, be allowed and listed for a Reformado Captain of a Troop of Horse, amongst the Adventurers Forces to be raised for the Province of Munster. That this House agrees with the House of Commons, in the Particulars of this Message. Ordered, That this House agrees to this Result of the Treaty with the Scotts. The Amendments in the Order concerning Mr. Whetcombe were read, and approved of. To deliver to them the Order for the Lieutenants and Deputies of several Shires to assist one another, if any Force be, with the Amendments; and likewise the Order concerning Mr. Whetcombe, with the Amendments. "It is this Day Ordered, by the Lords and Commons now assembled in Parliament, That the Treasurers of the Contribution and Loan-money at London do forthwith pay unto the Earl of Warwicke, or his Assigns, One Thousand Pounds for the Succour and Service of Landguard Fort, in Suffolk; and that the said Thousand Pounds shall be re-paid out of the Monies that shall come in upon the Bill of Four Hundred (fn. 3) Thousand Pounds." Ordered, That the Earl of Peterborough hath Leave to go into the Country, for his Health. That they will send an Answer, by Messengers of their own, concerning the Order touching Mr. Whetcombe; and concerning the Order for Lieutenants and Deputy Lieutenants to assist one another, they do agree with their Lordships in the Alteration. 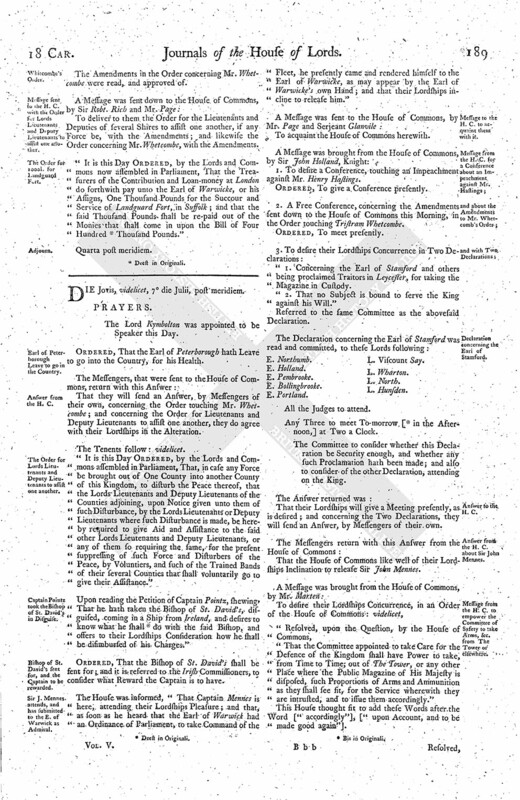 "It is this Day Ordered, by the Lords and Commons assembled in Parliament, That, in case any Force be brought out of One County into another County of this Kingdom, to disturb the Peace thereof, that the Lords Lieutenants and Deputy Lieutenants of the Counties adjoining, upon Notice given unto them of such Disturbance, by the Lords Lieutenants or Deputy Lieutenants where such Disturbance is made, be hereby required to give Aid and Assistance to the said other Lords Lieutenants and Deputy Lieutenants, or any of them so requiring the same, for the present suppressing of such Force and Disturbers of the Peace, by Voluntiers, and such of the Trained Bands of their several Counties that shall voluntarily go to give their Assistance." Upon reading the Petition of Captain Pointz, shewing, That he hath taken the Bishop of St. David's, disguised, coming in a Ship from Ireland, and desires to know what he shall (fn. 4) do with the said Bishop, and offers to their Lordships Consideration how he shall be disimbursed of his Charges." Ordered, That the Bishop of St. David's shall be sent for; and it is referred to the Irish Commissioners, to consider what Reward the Captain is to have. The House was informed, "That Captain Mennes is here, attending their Lordships Pleasure; and that, as soon as he heard that the Earl of Warwick had an Ordinance of Parliament, to take Command of the Fleet, he presently came and rendered himself to the Earl of Warwicke, as may appear by the Earl of Warwicke's own Hand; and that their Lordships incline to release him." To acquaint the House of Commons herewith. 1. To desire a Conference, touching an Impeachment against Mr. Henry Hastings. Ordered, To give a Conference presently. 2. A Free Conference, concerning the Amendments sent down to the House of Commons this Morning, in the Order touching Tristram Whetcombe. "1. Concerning the Earl of Stamford and others being proclaimed Traitors in Leycester, for taking the Magazine in Custody. "2. That no Subject is bound to serve the King against his Will." Referred to the same Committee as the abovesaid Declaration. E. Portland. L. Viscount Say. All the Judges to attend. Any Three to meet To-morrow [ (fn. 5) in the Afternoon,] at Two a Clock. The Committee to consider whether this Declaration be Security enough, and whether any such Proclamation hath been made; and also to consider of the other Declaration, attending on the King. That their Lordships will give a Meeting presently, as is desired; and concerning the Two Declarations, they will send an Answer, by Messengers of their own. That the House of Commons like well of their Lordships Inclination to release Sir John Mennes. "That the Committee appointed to take Care for the Defence of the Kingdom shall have Power to take, from Time to Time, out of The Tower, or any other Place where the Public Magazine of His Majesty is disposed, such Proportions of Arms and Ammunition as they shall see fit, for the Service wherewith they are intrusted, and to issue them accordingly." This House thought fit to add these Words after the Word ["accordingly"], ["upon Account, and to be made good again"]. That this House doth not concur with the House of Commons in this Vote. That Provision of Arms and Ammunition, out of the public Magazine of His Majesty, shall be, from Time to Time, disposed of, by Order of both Houses of Parliament, for the Safety of the Kingdom, upon Account, and to be made good again. The Lord Spencer dissented to this Vote. The Earl of Portland diffented to this Vote. That this House will send the House of Commons an Answer, by Messengers of their own. Ordered, That Sir Jo. Mennes shall be discharged for this Business he is now in Custody for. Ordered, That Mr. Maccarta shall have Three Pounds a Month paid him, until it comes to Thirty Pounds. Ordered, That a poor Man, that came out of Ireland, is referred to the Consideration of the Committee for Contribution; moved (fn. 6) by the Lord Viscount Say & Seale.